Tails 3.9 is the biggest update of Tails this year! This release also fixes many security issues and users should upgrade as soon as possible. 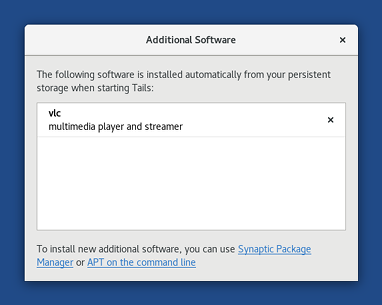 You can now install additional software automatically when starting Tails. To check your list of additional software packages, choose Applications ▸ System Tool ▸ Additional Software. Read our documentation on installing additional software. To unlock VeraCrypt volume in Tails, choose Applications ▸ System Tool ▸ Unlock VeraCrypt Volumes. 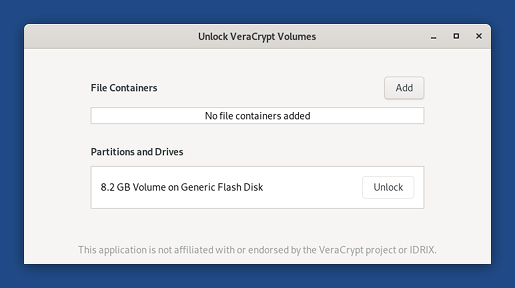 The integration of VeraCrypt in the Files and Disks utilities was done upstream in GNOME and will be available outside of Tails in Debian 10 (Buster) and Ubuntu 18.10 (Cosmic Cuttlefish). Read our documentation on using VeraCrypt volumes. Thunderbird is now the official RSS and Atom news feed reader in Tails. Liferea will be removed from Tails in version 3.12, early 2019. Improve the configuration of the persistent storage to make it easier to scroll and consistent with the GNOME guidelines. 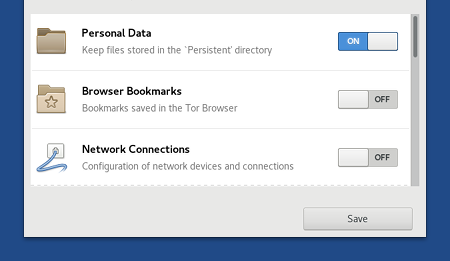 Update Tor Browser to 8.0, based on Firefox 60 ESR. Update Thunderbird from 52 to 60. Update Electrum to from 3.0.6 to 3.1.3. Update Linux to 4.17 which also fixes the Foreshadow attack. Update the DRM and Mesa libraries to improve support for some graphics cards. Update the Intel and AMD microcodes and most firmware packages. Per maggiori dettagli, leggi il nostro changelog. Vedi la lista dei problemi noti da tempo. Per installare, segui le nostre istruzioni per l'installazione. To upgrade, automatic upgrades are available from 3.7.1, 3.8, and 3.9~rc1 to 3.9. Se non potete fare un aggiornamento automatico o se Tails non viene avviato dopo un aggiornamento automatico, provate a fare un aggiornamento manuale. Tails 3.10 is scheduled for October 23.